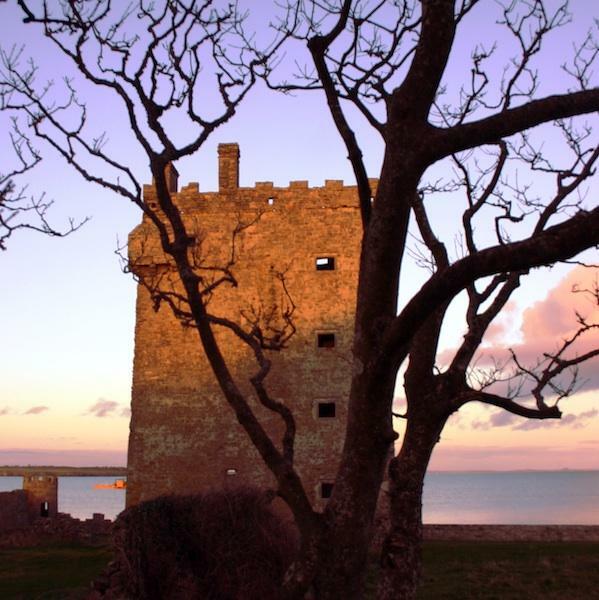 Carrigaholt Castle is one of Ireland’s best preserved “Tower Houses”, built around 1480 by the MacMahons, the last Gaelic Chieftains to rule this peninsula. Strategically located at the Mouth of the Shannon, the castle’s story reflects the turbulence of European politics. The 16th century ended with the final conquest of Gaelic Ireland by England’s Tudor Dynasty and the siege of the castle in1599 by the Earl of Thomond, loyal to the Crown. The notorious rebel chief, Teigue MacMahon lost his estate and was later killed in rebellion on the Beara Peninsula. Daniel O’Brien, brother of the Earl of Thomond, was granted the castle in 1602. Surviving the siege by Cromwells’s army in 1651, Daniel’s grandson was made First Viscount, Lord Clare of Carrigaholt in 1662. In the late 1680’s, he raised three regiments known as the Clare Dragoons comprising 2600 men to fight in the army of the deposed King James in his attempt to regain the English throne. Defeated at the Battle of the Boyne in 1690 by the army of William of Orange, James’ supporters were later granted amnesty to sail to France. The Clare Dragoons of Carrigaholt left Ireland to join the French army in what was known as “the Flight of the Wild Geese”. The 6th Viscount, Lord Clare, Charles O’Brien, became Marshal of France in 1757. In 1697, the estate was granted to the Earl of Albermarle and later sold. The Burton Family acquired the castle and lived here until the end of the 19th century. The castle is under the protection of the Office of Public Works and National Monuments. The grounds are privately owned.